Koolatron. It’s National Picnic Month: You’ve got a few more days to celebrate. How about an impromptu picnic this weekend? There is only one way to pack a cooler safely, say the experts at Common Ground, which dispels myths about food and aims to provide confidence about what you feed your family. With picnics, the drill starts with ice. Ice. Most foods need to be kept below 40° Fahrenheit to avoid spoiling. This can only happen with ice (we use reusable ice packs). Heat rises, so be sure to put ice on the bottom of the cooler and pack it tightly around food so that perishable items stay cool. Cold Meats. Pack perishable foods, like meat and chicken, directly from the refrigerator or freezer. Raw frozen meat acts as another cooling block, helping to keep the cooler temperature lower, for longer. Freezing the meat also reduce bacterial growth on the food and cuts back on dripping inside the cooler. Wrapping and Placement. When transporting food in a cooler with meat or vegetables, wrap food in plastic sealable bags to catch any spills or drips of juice. When raw meat is not bagged and sealed, it can leak to the bottom of the cooler and potentially drip on other foods, causing contamination. If you can pack meat in a separate cooler, so much the better. If you have to pack meat and vegetables in the same cooler, pack meat products on the bottom so they can’t drip onto other foods. Grilling. If you’re grilling at the picnic site, make sure food is cooked to the right temperature. The proper internal grilling temperatures range from 145° Fahrenheit for beef and pork, to 165° Fahrenheit for poultry. Bring a meat thermometer with you (here’s a special grilling meat thermometer). Leave raw meat in the cooler until you’re ready to grill it. Don’t leave grilled meat out in the heat; put it back into the cooler until someone is ready to eat it. Separate Coolers. 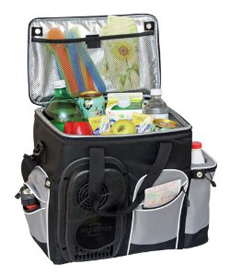 When traveling long distances, pack two separate coolers: one with food and the other with drinks. 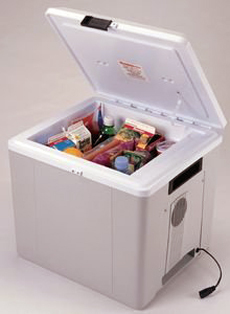 People will be opening the drink cooler more often, which will raise the temperature in the food cooler. Another idea is to freeze some bottled water and other bottled drinks, not only to keep them cooler for later in the day, but to act as extra “ice” for the food cooler. Shade. To maintain cool temperatures, open and close the cooler lids quickly and store coolers in a shady spot. This cooler acts a a mini fridge: it plus into a 12-volt outlet, such as the car’s cigarette lighter. From Koolatron. Safe Zone. Discard any perishable food that is left out for more than two hours: It will be at risk for increased bacterial growth. If temperatures are above 90° Fahrenheit, one hour is the maximum time food should sit out. Clean Utensils. Cooking utensil safety is an important of food safety. To avoid cross contamination, use different utensils for cooking and cutting meats and vegetables. Store utensils outside of the cooler in separate plastic bags, or wrapped in clean kitchen towels. Use moist towelettes to clean hands between handling different foods. And have a great picnic!